Sunset after one of the first snowfalls of December 2005 Kunkletown, Monroe County Photo by Harold Jenkins, anothermonkey.blogspot.com. 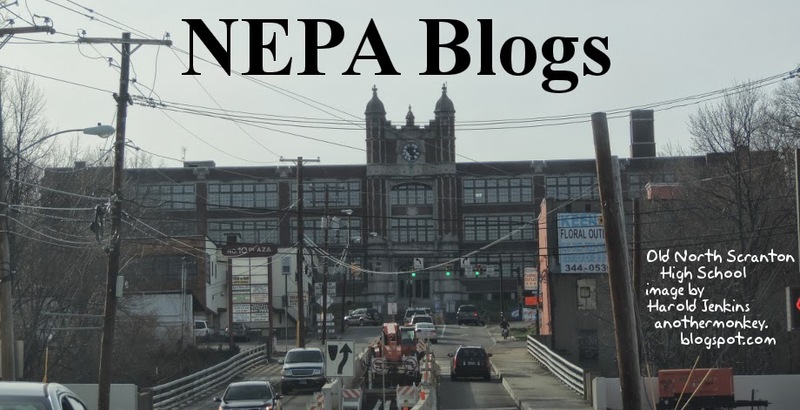 If you have a photo you'd like us to use as the NEPA Blogs header, send it to us at nepablogs@gmail.com. NOTE: Due to a scheduling conflict, the Blog of the Week segment did not run this week on PA Live! Fingers crossed that Trish's blog runs next Tuesday! Angel of the Broken Step. Photo by Harold Jenkins, anothermonkey.blogspot.com. Have a photo you'd like to see as the NEPA Blogs header? 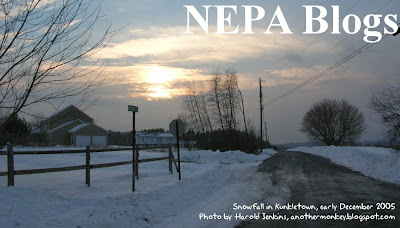 Send it to us at nepablogs@gmail.com. PA Live! Blog of the Week: Wren Cottage Live! You can watch this episode on the PA Live! 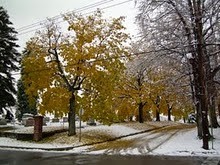 homepage at http://www.pahomepage.com/story/d/story/blog-of-the-week-wren-cottage-live-november-19th-2/41215/vureu3dB1E6aqg-iMuaG8A. Our PA Live! Blog of the Week this week is Melissa Whalen Haertsch's Wren Cottage Live! 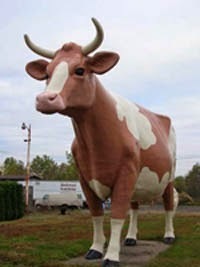 (http://wrencottagelive.blogspot.com/). 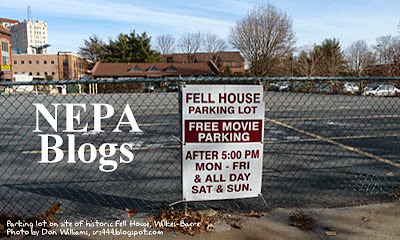 Over the years that I've been blogging and co-administering NEPA Blogs, I've gotten to know a lot of people through their blogs, and have eventually met many of them in person at blogging events (or, occasionally, completely at random in shopping center parking lots.) Wren Cottage Live! is unusual in that I have known Melissa Whalen Haertsch for many years. In college she was one of the best writers I knew, and the fact that the shelves of bookstores are not filled with her works is one of the many major failures of the publishing industry in recent years. We lost touch over the years, occasionally meeting at friends' weddings, or funerals, or at college reunions. So I was glad to come across her blog some time ago, because it gave me the opportunity to once again read her writing - and to see where life has taken her. The Melissa I knew was equally at home in the country and in the city, having spent time living in each. 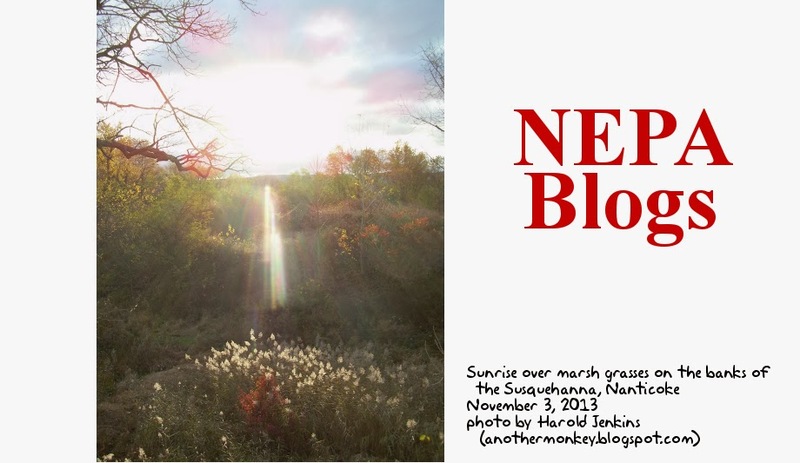 In her current incarnation she writes from her home base in Dimock, PA, an idyllic region of rolling farmland which has been the epicenter of the natural gas industry in Northeastern Pennsylvania, and all the controversy that surrounds it. Since July 2009 she has blogged at Wren Cottage Live! about the experience of making a home in such a place, with all its joys and sorrows, hard work and great pleasure. Dealing with troublesome geese, making bread in a hand-made oven, taking her dog for his final walk on the farm - all this from someone of tremendous literary prowess, with skills to make pens go limp in the hands of lesser writers. Very few of us have had lives that compare closely to the full scope of the life of Melissa Whalen Haertsch. But her facility with words allows us to get a glimpse of a life that is not our own, that is totally foreign to the lives many of us lead - all through her blog, Wren Cottage Live! Secret identities are hard to maintain on the Internet. We leave so many footprints and fingerprints online, it usually doesn't take much effort to find out the real name behind the nom de blog. Still, here's one where the blogger is trying to maintain a secret identity - successfully, so far. "Of All Things Geek I Am..."
A fun and informative blog letting you indulge your inner geek as Agent Palmer indulges his. Films, animation, comedy, comic books, technology - Agent Palmer covers it all, and then some. I don’t shy away from the term “geek.” I never have. I take it as a compliment. The same goes for “nerd” “dork” “dweeb” and “freak”. I wear them all as badges of honor. This blog is an amalgamation of all the things that make me a geek and my opinions of them. .I play Magic the Gathering as well as other CCGs and, if time and circumstances would allow, I’d play D & D. I enjoy reading books and comics. All classic geek things to do. But I don’t just fit into one mold. I enjoy playing my guitar and bass. I enjoy sports (both fantasy and real). I play video games, although my favorites are classics that I grew up with: Duke Nukem, Warcraft II, Civilization; and The Tales series, Zelda, Dragon Quest and Skies of Arcadia. Technology is a hobby as much as an interest. I enjoy coding websites. But most of all I enjoy knowledge, the search, research and understanding of topics both big and small, topical and historic. I took my name from my hero Agent Harry Palmer, Michael Caine's character in a series of spy films starting with the IPCRESS File. And I am currently in the middle of a Rotospective to Ralph Bakshi thusly named because of the rotoscoping technique he used. I'm doing in depth reviews/commentary on all of his films. Agent Palmer has an online presence that goes beyond this blog. Check out his About page for a list of links, or find out more by contacting him through his Contact page. Or just visit Agent Palmer and see what you can learn! 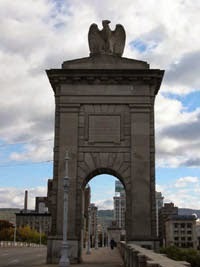 In the earliest years of the 19th century Jesse Fell developed a practical way of using a raised grate to burn anthracite coal to generate heat, opening up the development and exploitation of anthracite coal resources throughout Northeastern Pennsylvania - and paving the way for the Industrial Revolution. 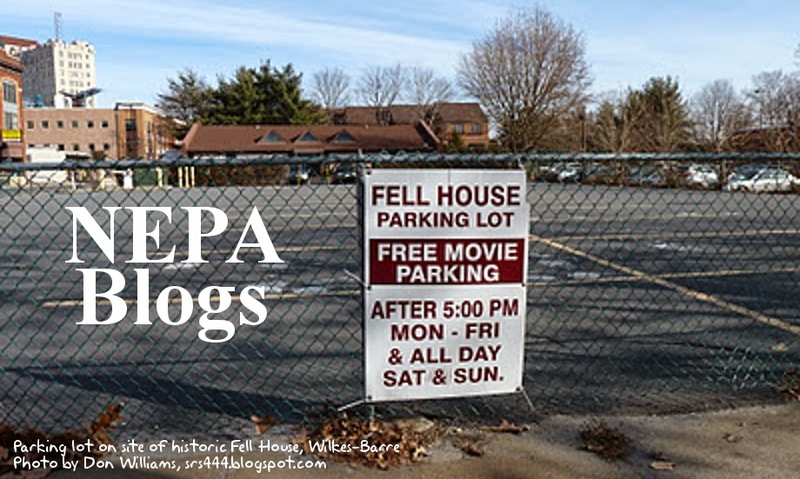 The Fell House and Tavern stood in Wilkes-Barre until relatively recently, when it was torn down to make way for a lovely parking lot. The historical nature of this parking lot is commemorated in signs such as the one above. Photo is courtesy of Don Williams, the Susquehanna River Sentinel (www.srs444.blogspot.com). Our PA Live! 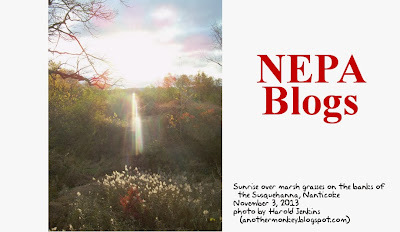 Blog of the Week this week is Paul Smeltz's The Forwardian Arts Society (http://forwardianartssociety.blogspot.com/). On the outskirts of Northeastern Pennsylvania, bordering New York and the Lehigh Valley, is the arts mecca of Stroudsburg. You can't throw a rock in Stroudsburg without hitting an artist or musician, though such behavior is frowned upon. Since June 2006 Paul Smeltz has taken it upon himself to report on the artistic goings-on in and around Stroudsburg. 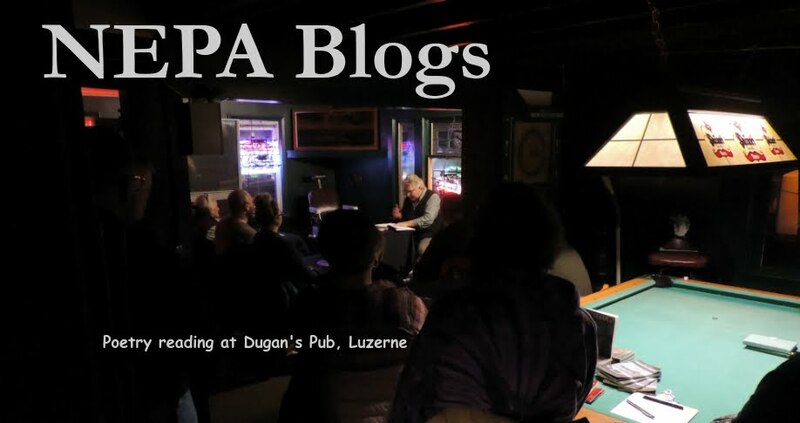 With words and pictures, Paul tirelessly posts about arts news and events in the Stroudsburg area on his blog, The Forwardian Arts Society. 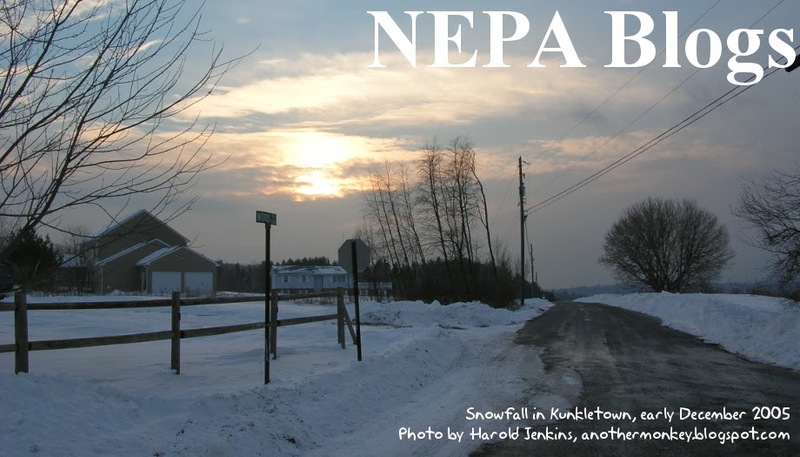 Northeastern Pennsylvania is seen by some as a thing of the past, a place where things used to happen, good only for nostalgia and dreams of better days. But there is so much in Northeastern Pennsylvania that is vibrant and dynamic. The biggest problem is that people simply don't know about it! Blogs like The Forwardian Arts Society keep us aware that this area is full of good and exciting things, just waiting for us to notice them! On the morning of Sunday, November 3, we turned our clocks back to Standard Time, allowing an extra hour of sleep. Like a chump, I decided to wake up at 5:00 AM to be ready to greet the sunrise from the Nanticoke-West Nanticoke bridge in hopes of seeing the partial solar eclipse as it rose. Unfortunately, the clouds had other plans, and the sun was completely obscured - until I walked away. Then the sun came out, and I was able to grab the photo above - well after the eclipse was over. I know Northeastern Pennsylvania is full of great photographers, and maybe people who don't consider themselves great but have a camera and aren't afraid to use it. We need your photos! 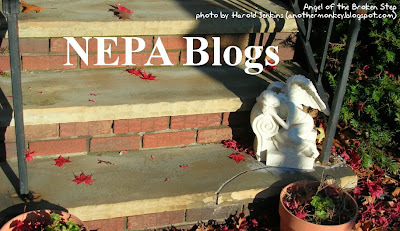 Send them to us at nepablogs@gmail.com and we'll use them as the NEPA Blogs header of the week! There are plenty of movie review sites around, in NEPA and elsewhere. The Iron Reels Review isn't like any of the other ones. 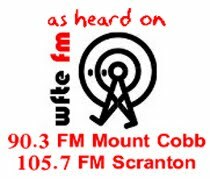 Since its founding in April 2013, its focus has been on experimental films, especially those made in the Scranton area. But the reviews aren't limited to films made in any specific genre or region. By their nature, many of these films are not ones that you will encounter in everyday life. For the most part they are well outside of the mainstream. With the Iron Reels Review Kevin and Kyle bring information about those films to those of us who live outside of the world of experimental art. Filmmaking is a labor of love, an enormous amount of effort that may be going into something only a few will see. Kevin Vogrin and Kyle Rebar's Iron Reels Review makes sure that at least a few of those films come to the attention of a few people who might otherwise have never heard of them. Check it out!